IT WAS the first total solar eclipse since 1979 to cross any part of the continental United States, and the first in 99 years to traverse the country from sea to shining — well, maybe not shining — sea. Not until 2045 will there be another Great American Eclipse like the one we experienced on Aug. 21, when the moon's shadow blocked out the sun, generating a path of totality from the Pacific coast to the Atlantic. Total solar eclipses aren't that rare; one occurs somewhere on earth every 18 months or so. But for a given location to find itself in the middle of a total eclipse is rare indeed: It happens on average only once every four centuries. That helps explain why eclipses evoke such astonishment and wonder, and why so many people will travel far to see one. To witness this year's solar spectacle, millions of Americans took to the road, causing cosmic-level traffic jams and what may have been the greatest temporary migration of humans to view a natural event in US history. And what of those of us who couldn't make it to Salem, Ore., or Paducah, Ky., or Columbia, S.C., or any of the other communities within the path of totality? 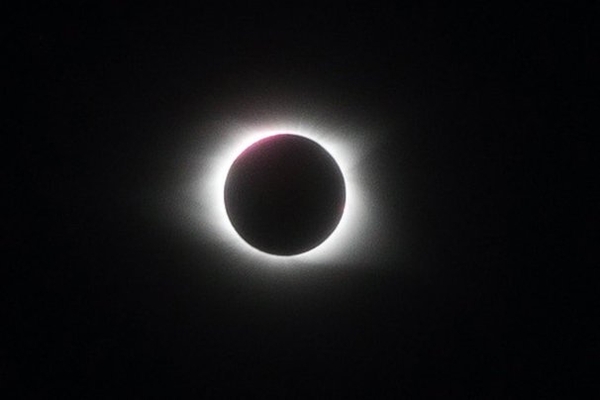 We all watched on TV as the unbelievable happened, right on schedule: The enormous Sun vanished behind the tiny moon, the fantastic corona appeared, and darkness reigned in the middle of the day. In person or remotely, hundreds of millions of Americans were watching on Aug. 21. That was "nearly twice the number of people that watched the Super Bowl last year," marveled The New York Times. If only for a few minutes, Americans were united during the eclipse in a way we almost never are anymore. And what united us was not some political outrage or horrific shooting. It was an eerie astronomical marvel, beautiful and awesome and joyful. The moon's shadow raced from coast to coast, and we Americans, in all our diverse and messy and quarrelsome totality, were elated.